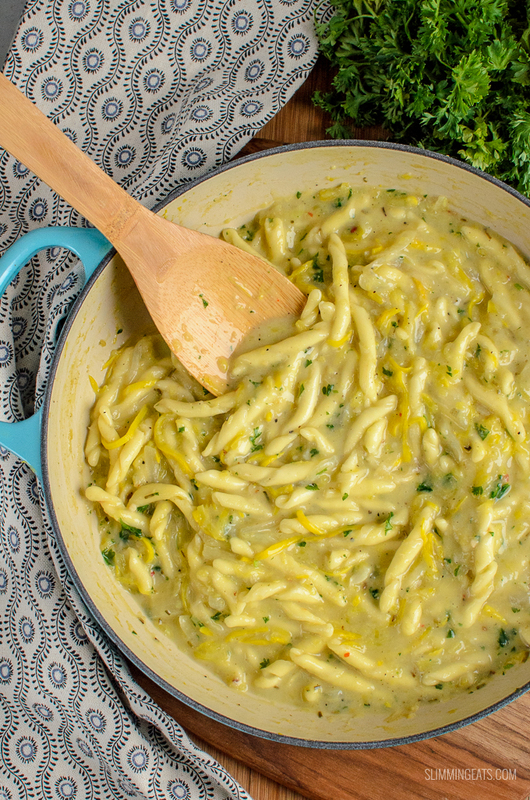 Garlic, Yellow Zucchini and Pasta – simple ingredients combine for a delicious Dairy Free One Pot Creamy Yellow Zucchini Pasta. 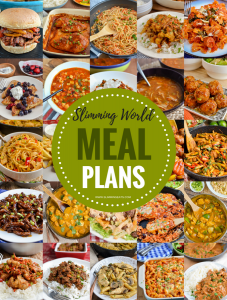 When you have certain dietary restrictions it can be hard to find delicious recipes to enjoy, because not being able to eat a certain food, can mean many recipes are off bounds. 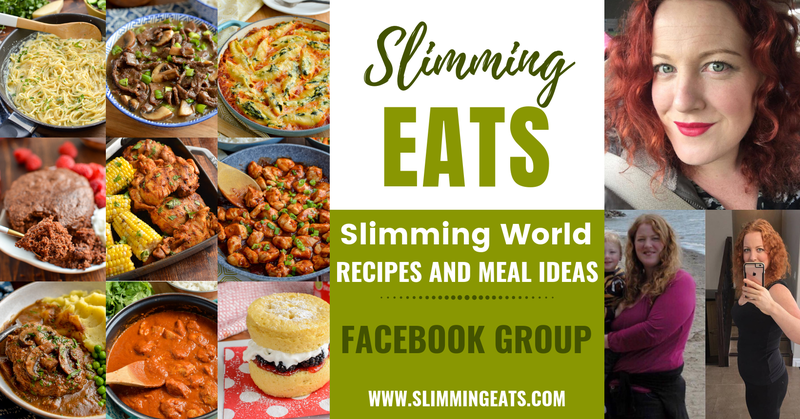 I always try to create a good balance of recipes, so that all my readers no matter what restrictions have a good selection of recipes to choose from, either by offering suggestions to make it gluten/dairy free where possible or by swaps to make it vegetarian. 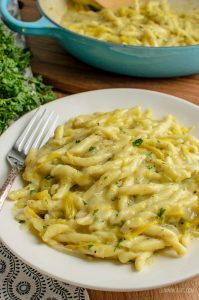 So tonight when going to make these delicious Creamy Yellow Zucchini Pasta, instead of adding one of my usual ingredients like cheese or similar for that creamy taste, I thought about how I could add that creaminess without using any dairy to create a recipe for my dairy-free readers out there and this turned out perfectly. All cooked in one pot too, it really is an effortless dish. Nice and quick to make, and super quick to clean up afterwards. 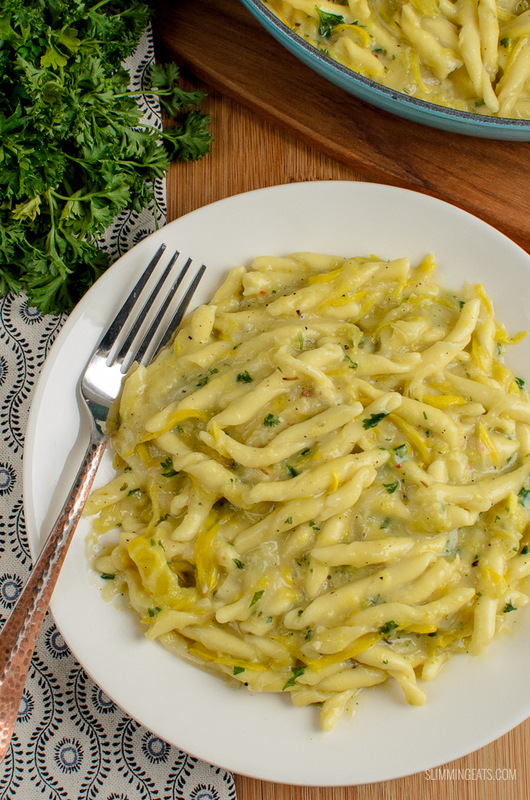 Gotta love an easy to make dish, like this One Pot Creamy Yellow Zucchini Pasta, right? If yellow zucchini (courgette) is not in season or is hard to find where you live, you can just substitute with regular zucchini. Both are pretty similar in taste. 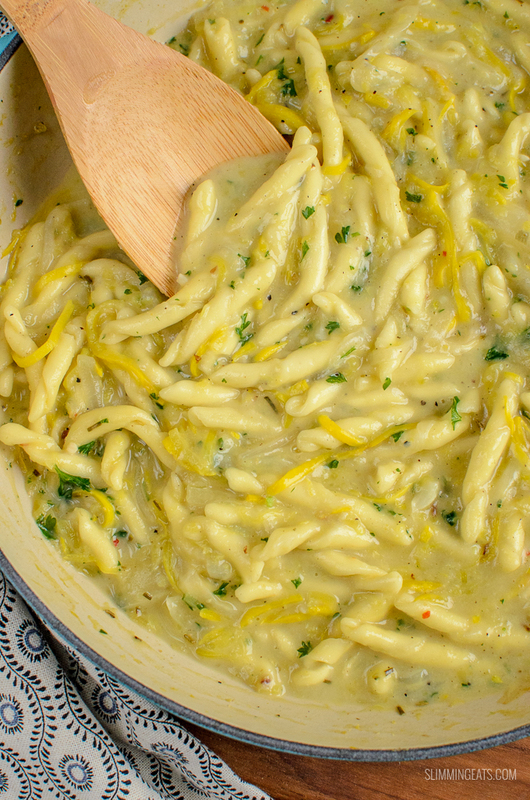 You can either slice the zucchini by hand with a sharp knife or use a julienne peeler, which was what I chose to use for this dish to create fine little ribbon strands which add a pretty yellow fleck to this One Pot Creamy Yellow Zucchini Pasta. If you have a Vegetable Spiralizer, that is also a great option. The creaminess from this dish we get from using Coconut Milk. Coconut milk is a great option for adding creaminess to dishes when you can’t have dairy. I opt to use light Coconut Milk because it is less syns than regular coconut milk but still gives enough creaminess to a dish. 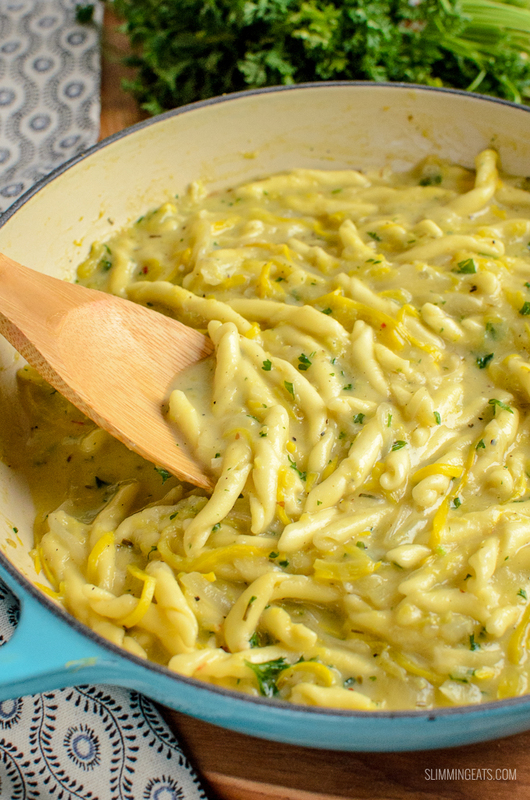 I do recommend making sure you use the canned versions of coconut milk and not the carton drinking milk for this One Pot Creamy Yellow Zucchini Pasta because the latter tend to be a lot more watery and you just will not give the same result. This recipe was just for me and the kids tonight, so is just a two adult serving, but if you want it to serve more, just double up the recipe. A little tip for leftover coconut milk, if you are not planning to use it, is to pop it in a tub in the freezer. It will come in super handy next time you need some coconut milk for a recipe. 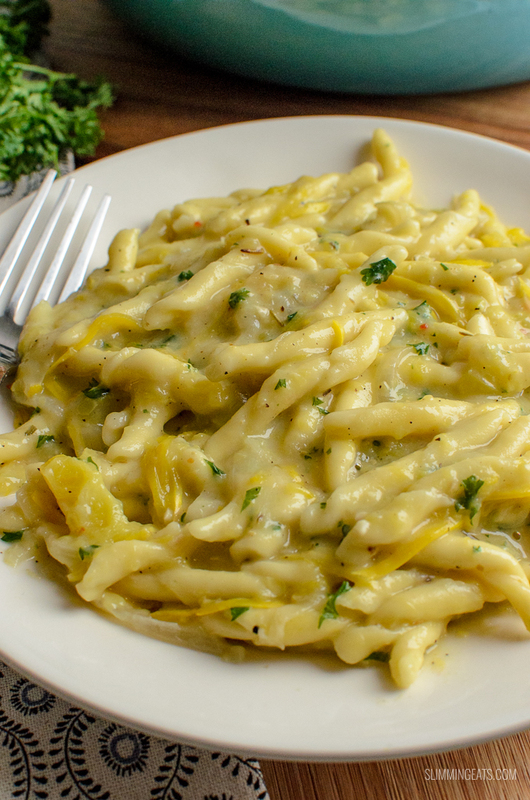 HOW CAN I ADD A 1/3 SPEED FOODS TO THIS ONE POT CREAMY YELLOW ZUCCHINI PASTA? There is already onions, garlic and plenty of yellow zucchini in this dish, but an additional side salad or even some steamed veggies like broccoli or cauliflower will add some more speed food to your plate while keeping you well satiated. WHAT KITCHEN ITEMS DO I NEED TO MAKE THIS ONE POT CREAMY YELLOW ZUCCHINI PASTA? Spray a deep frying pan over a medium-high heat with cooking oil spray. Add the onion and fry for a couple of minutes until translucent. Add the garlic and fry for a minute to infuse flavour. Add the zucchini, pasta, stock, coconut milk, Italian seasoning and parsley. Bring to a boil, reduce heat, cover and simmer for approx 12 minutes until pasta is cooked through and sauce has reduced down and is silky and creamy. it’s not overpowering no, but if you really dislike coconut, this may not be the dish for you. Try some of my other pasta recipes.